Extra, Extra...Read all about it! In its very first meeting on Wednesday, March 27, 100 Women of BCS donated $15,100 to the CSISD Education Foundation. 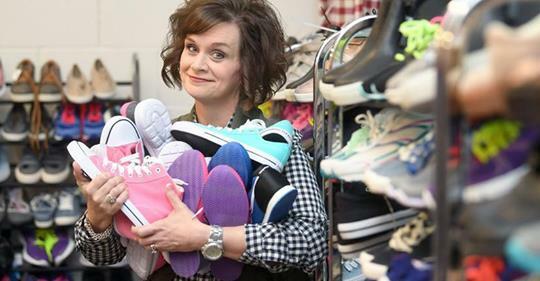 The funds will be used to provide clothing and essentials through Chrissy’s Closet, as well as books through the Amy Anderson Literacy Legacy; both programs of the Education Foundation serve students in need. COLLEGE STATION, Tex. (KBTX) - Students are reaping the benefits of grants given to them this year from the College Station ISD Education Foundation. The money went towards special projects to make classrooms more interactive and fun. On Tuesday, the grown-ups were the ones taking a field trip. First stop: Kristin Lehrmann's class at Cypress Grove Intermediate School. They run 'Cats Coffee Cart' and make and deliver a hot cup of joe to other teachers in the school. “Many of our special needs students will not be going to college. This gives them vocational skill that when they graduate from our program, they can go out and be employed," said Teresa Benden with the College Station ISD Education Foundation. College Station ISD Education Foundation donors, board members and staff got a first-hand look Tuesday at how a few of the thousands of dollars in teacher grants have been used in College Station classrooms. Though Shannon Long’s job title at the College Station school district is technology coordinator, Jamee Brick uses a different descriptor for her friend: catalyst. “She’s a catalyst for goodness, a catalyst for giving,” Brick said. Long, though, shies away from the spotlight and any recognition her work might receive. Starting as an intimate gathering of about 300 people, College Station ISD Education Foundation's 50 Men Who Can Cook fundraiser has grown over the years to where a couple thousand people usually walk through the doors. The 12th annual event is the "signature fundraiser" for the CSISD Education Foundation. The money from Friday night's event and others throughout the year goes toward supporting scholarships, innovative teacher grants, Success 24/7, the Pre-K and Head Start book voucher program and Chrissy's Closet. COLLEGE STATION, Tex. 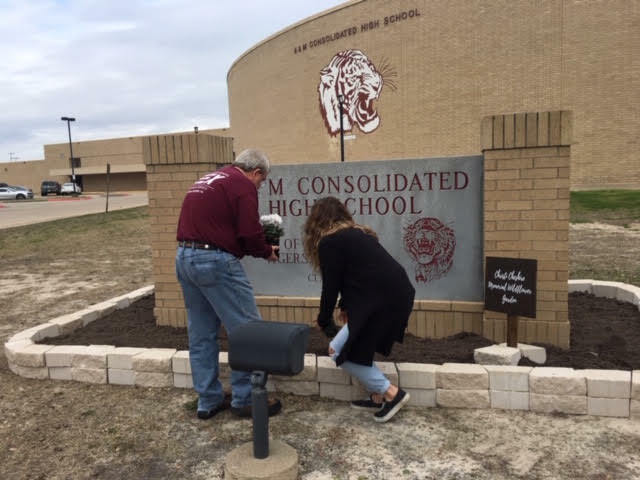 (KBTX) - A beloved teacher and former Dean of Students at A&M Consolidated High School was honored Thursday by students and faculty. Christi Cheshire passed away in 2018. According to the College Station ISD Education Foundation, Cheshire spent 33 years at AMCHS. Since her death, the district has set up a scholarship in her name, and on Thursday, staff from different departments at the school participated in a Chili Cook-off to raise money for the scholarship fund. Jay O'Brien live at the 12th annual 50 Men Who can Cook event at the Expo Center. What was once a small, more intimate gathering of 50 cooks has turned into a successful fundraiser with more than 2,000 people in attendance. 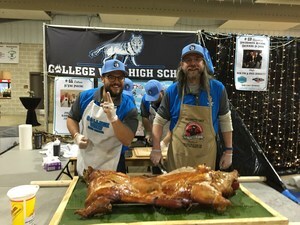 The 12th annual 50 Men Who Can Cook will take place on Feb. 1 at the Brazos County Expo Complex from 6:30 to 9:30pm and feature 68 booths with representatives from local schools and the community. The 20th annual Grant Patrol -- made up of foundation board and staff members, donors and district drumline and cheerleading students -- delivered 43 grants totaling $156,012. The group handed out over $150,000 in grants to teachers Wednesday. 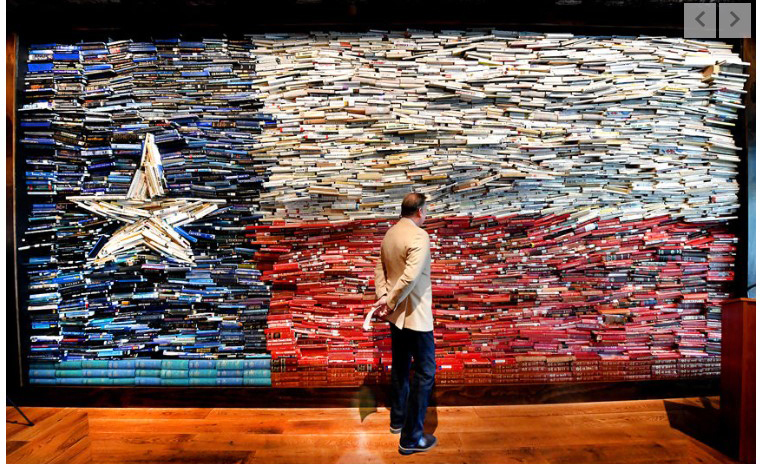 Neil Bush was on hand Wednesday to help dedicate the book wall art installation in The George hotel to his mother, former first lady Barbara Bush. During the dedication, Bush also presented College Station ISD Education Foundation Executive Director Teresa Benden with a $1,000 check to benefit the foundation's Amy Anderson Literacy Legacy program. College Station ISD employees are breaking records in their giving to the district’s Education Foundation this year by pledging over $127,000 through the Employee Giving Campaign. COLLEGE STATION, Texas -- College Station I.S.D Education Foundation is honoring one of their own – by working to keep her legacy alive. Christi Cheshire passed away earlier this summer, now the Education Foundation is working to create a scholarship in her memory. During the CSISD Education Foundation's 18th annual Hall of Fame banquet at the Hilton, each student honored as outstanding was given the chance to recognize the district employee -- teacher, custodian, librarian, food services staff member or administrator from throughout their years at CSISD -- who influenced their life. COLLEGE STATION, Tx. 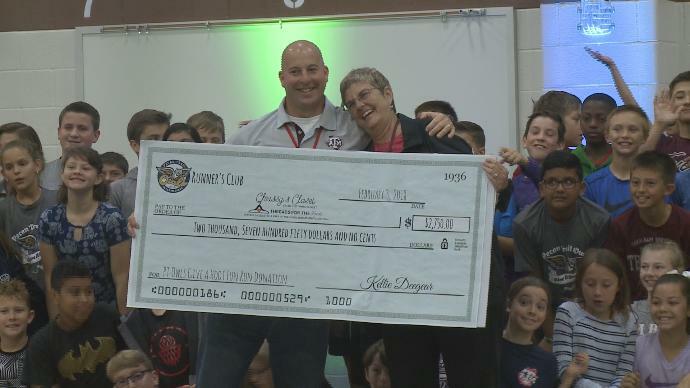 (KBTX) Chrissy's Closest received a big donation Friday morning thanks to the efforts of Pecan Trail Intermediate School students. Supporters of College Station schools toured six classrooms Wednesday seeing how grants given by the CSISD Education Foundation have been put into action. 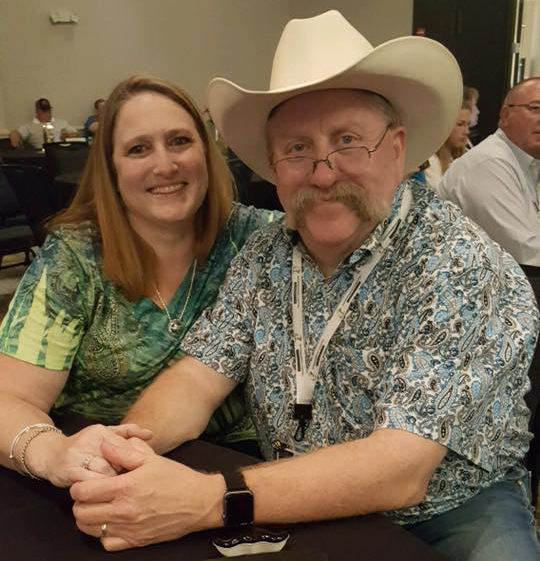 One hundred and thirty-four local community and school leaders helped the College Station ISD Education Foundation raise over $225,000 at its 11th Annual 50 Men Who Can Cook on February 2. What do you get when you mix 50 men, a dash of costumes, a heaping of recipes, and a pound of fun? A recipe for a great night to support local education. On Feb. 2, the College Station ISD Education Foundation hosts its 11th Annual 50 Men Who Can Cook event. 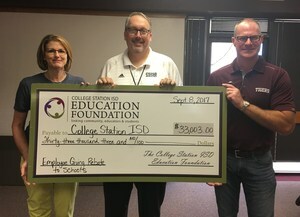 College Station, TX -- The College Station ISD Education Foundation today awarded 51 innovative teaching grants totaling $137,338 during its annual Grant Patrol. This year’s grants include exciting entrepreneurial projects, robotics and engineering missions, outdoor gardens, charitable giving leadership opportunities, broadcasting through podcasting, music development, and creative writing. Grant Patrol consists of Education Foundation board members and donors, along with the A&M Consolidated and College Station High School cheerleaders, mascots, and drum lines that visit CSISD campuses to award grants to this year’s winners. Each winning teacher is surprised with a check and cheering presenters to mark the occasion. The CSISD Education Foundation has awarded 469 teacher grants totaling $1,141,279 since its inception in 1999. Many businesses and community members make these grants possible through fundraising events and donations. This year’s Founder’s Level Sponsors are CHI St. Josephs Health, C.C. 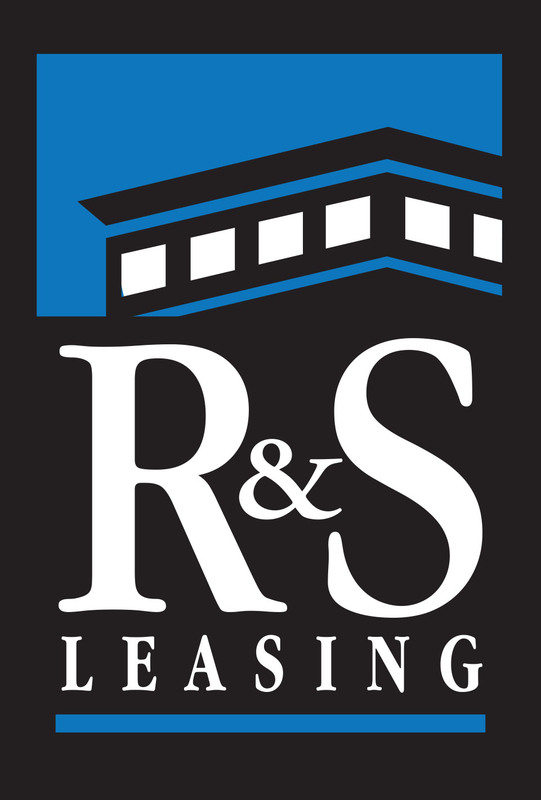 Creations, Caldwell Country, Copy Corner, Culpepper Realty, HEB and Rife Law Firm. The CSISD staff also has supported the Education Foundation by donating over $100,000 through the employee giving campaign this year. The Education Foundation accepts grant applications annually in the fall from district teachers and staff for the development and implementation of innovative teaching programs within the classroom. 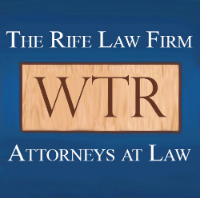 Grants are awarded for programs which are not otherwise funded by tax dollars. Grants are selected by a committee comprised of board members and curriculum/instruction staff. For more a complete list of the grants awarded visit givetokids.csisd.org. For more information, please contact Teresa Benden (979)-664-5615 or tbenden@csisd.org. he College Station ISD Education Foundation today announced that College Station ISD staff have pledged over $100,000 this year through the Project Smile Employee Giving Campaign. The College Station ISD Education Foundation today announced that College Station ISD staff have pledged over $100,000 this year through the Project Smile Employee Giving Campaign. Project Smile “Spreading More Innovative Learning to Everyone” is this year’s employee giving initiative of the CSISD Education Foundation. The internal fundraising campaign gives all staff the opportunity to invest in educational programs throughout the district. Additionally, half of each campus employee’s gift is earmarked for their own school. “This is an exciting milestone for the Education Foundation and the district,” said Dr. Clark Ealy, Superintendent for College Station ISD. “It demonstrates our commitment to education and our personal investment in the success of our students." 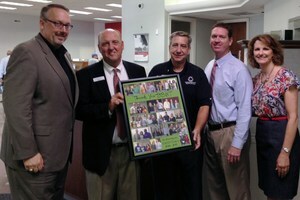 The Employee Giving Campaign was launched seven years ago with $15,000 in donations received and has grown each year. This year’s total officially reached $100,050, with 45% of district employees participating through automatic payroll deduction or a one-time gift. “We are overwhelmed by the generosity of the teachers and staff for Project Smile,” said Curt Mackey, Board President of College Station ISD Education Foundation. 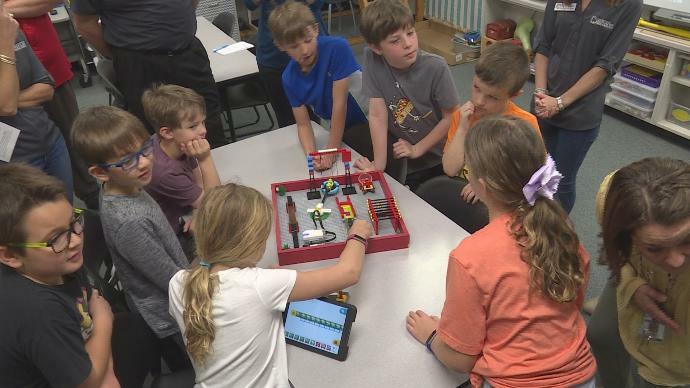 "It shows the great partnership between the Foundation volunteers and district employees to put resources in the classroom to challenge and engage our students. We will continue to work hard to set new records of support this year for our staff and students." Funds raised through Project Smile support innovative teaching grants, student scholarships, Chrissy’s Closet, Success 24/7 website, and the Amy Anderson Literacy Legacy, a book voucher program for Pre-K and Head Start students. With half of gifts going back to their home campus, principals and the “Campus Champion” (campus representative) engage funds to best serve their individual school. Thirty-three thousand was the combined contribution that was awarded back to campuses based on last year’s giving. The College Station ISD Education Foundation is a non-profit, 501(c)(3) organization founded in 1999 to provide support for students and teachers, above and beyond the normal operating budget of the school district, for educational opportunities not available through tax revenues. Our mission is to link the community, educators and students to secure a world-class education. Discover more at www.givetokids.csisd.org. LIKE us on Facebook at https://www.facebook.com/CSISDEF. Contact Teresa Benden, CSISD EF executive director, at 979-694-5615 or givetokids@csisd.org. The A&M Consolidated High School Class of 2017 has designated part of their class gift funds to help complete an endowed scholarship with the College Station ISD Education Foundation. The A&M Consolidated High School Class of 2017 has designated part of their class gift funds to help complete an endowed scholarship with the College Station ISD Education Foundation. These funds will be partnered with the AMCHS Class of 2011 & 2012 Scholarship to fully endow it at the $25,000 level. "The AMCHS Senior Class of 2017 contributed to an Education Foundation scholarship because we wanted our senior gift to focus on the pursuit of higher education for all individuals,” said 2017 Senior Class President Emily Garrett. “As a class, we wanted to make a lasting impact on our school that goes beyond a physical contribution. 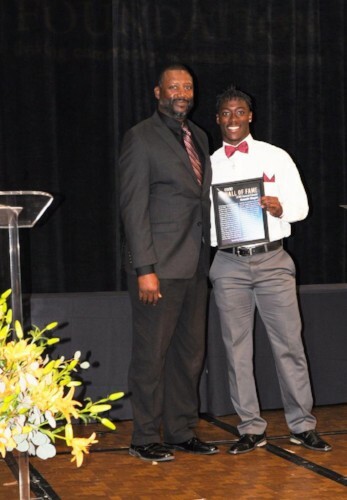 We hope that this scholarship will help advance the next generation of Consol students to their fullest potential." This May, the Education Foundation will be awarding 49 scholarships totaling $54,750 to seniors graduating from A&M Consolidated and College Station High Schools. Eleven of these scholarships are endowed. Established in 1999, the Education Foundation helps our community partner with our school district to provide support for innovative teaching grants, student scholarships and other special programs. The College Station ISD Education Foundation awarded 52 scholarships totaling $59,000 at its annual scholarship reception on May 17th. Recipients are graduating from either A&M Consolidated High School or College Station High School. To date, the Foundation has awarded 393 scholarships totaling $412,650. Twelve of these scholarships are endowed. t's not uncommon for front office staff and administrators at Oakwood Intermediate to hear ukulele renditions of the same song over and over again for six class periods, but standing before the donors who made such music possible this week, the school's principal said he couldn't be more grateful. Armed with aprons and -- as one organizer puts it -- "lots of bacon," men from the area hope to raise more than $200,000 for College Station students and teachers. The College Station ISD Education Foundation will surpass the $1 million mark in giving to classrooms through innovative teacher grants during its upcoming Grant Patrol on Thursday, November 10. Education Foundation board members along with donors, 50 Men Who Can Cook Celebrity Chefs, cheerleaders and drum lines will visit all 16 CSISD schools to award this year’s grants. Festivities will begin at Rock Prairie Elementary at 8:30 am with a $1 million check presentation to the district representing the culmination of 17 years of giving from the Education Foundation. "It is inspiring to see how much our community is taking an active role in education by supporting our Education Foundation,” said CSISD Superintendent Dr. Clark Ealy. “We are grateful for their overwhelming support so that we can continue to offer innovation and leading-edge technology into our classrooms." Including this year’s awards, the Education Foundation has given 417 teacher grants for a total of $1,003,941 to College Station ISD. Teacher grants are applied for annually by district teachers and staff for the development and implementation of innovative teaching programs within the classroom not otherwise funded by tax dollars. Examples of the variety of teaching grants awarded this year include: Gene regulation/DNA sequencing for high school students; outdoor classrooms for all head start/Pre-K students; Dash & Dot robots for students to learn coding and programming; ukuleles for all grades 1st – 6th; flexible seating options across the district; and an embroidery machine for special education students to develop a skill and business within our community. Grants are selected by a committee comprised of board members and district curriculum and instructional staff. In its 18th year, the CSISD Education Foundation has raised more than $3.8 million through community and corporate donations. The College Station ISD Education Foundation is pleased to announce that Commerce National Bank will be the Top Chef Sponsor for their 10th Annual 50 Men Who Can Cook set for Friday, February 3, 2017, at the Brazos County Expo. CNB Vice Presidents Randy Ripple (far left) and Suzanne Neuberger (far right) presented a $10,000 check to CSISD EF Executive Director Teresa Benden and Board President-Elect Curt Mackey at the recent A&M Consolidated vs. College Station High School football game. The event proceeds go to support innovative teaching grants, student scholarships and the CSISD Success 24/7 learning website. "Commerce National Bank is proud to support the 50 Men Who Can Cook event benefiting the CSISD Education Foundation," said Ripple. "We believe it is imperative to support the men and women who are educating our young people, as they are the future leaders of our nation." Commerce National Bank has been the Top Chef Sponsor for the past 9 of 10 years. "We appreciate Commerce National Bank's partnership with the Education Foundation," said Benden. "It's businesses like these that we depend on to help us make our public schools some of the best in the nation." A huge THANK YOU to Caldwell Country Chevrolet for sponsoring our inaugural gift card program for 1st-time teachers at CSISD. Thirty-six first-time teachers received a $50 Office Max gift card at the recent New Teacher University Breakfast to get their classrooms up and running! "We acknowledge that the expense of starting a classroom can be a huge burden on our first-time teachers," said EF Director Teresa Benden. "We've been wanting to implement this program and are blessed to have Caldwell Country underwrite it." The College Station ISD Education Foundation awarded 44 scholarships totaling $48,250 at its annual scholarship reception on May 18th. Recipients are graduating from either A&M Consolidated or College Station High Schools. To date, the Foundation has awarded 341 scholarships totaling $353,650. Nine of the scholarships are endowed. Thank you to our very generous donors who continue to help us support our students' futures. Roasted duck, waffles, jambalaya and frosted pickles were just a few of the many dishes sampled by hungry guests Friday night. 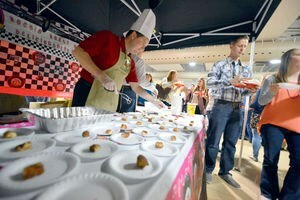 Over 131 local school representatives and community members showcased their cooking skills at nearly 70 booths at the Bryan Expo Center for the ninth annual 50 Men Who Can Cook fundraiser benefiting the College Station Independent School District Education Foundation. The College Station ISD Education Foundation awarded a record 59 innovative teaching grants totaling $120,923 at all 16 campuses during its annual Grant Patrol on Monday, November 9. A fifty percent increase over last year, these grants will directly impact over 85% of CSISD students. This year’s grants include everything from a week-long astronaut science camp, entrepreneur projects, outdoor classrooms and gardens, to hands-on learning accessories for iPads, digital microscopes and Lego story building kits. The grant patrol, consisting of Education Foundation board members, donors, A&M Consolidated and College Station High School cheerleaders, mascots, and drum lines will visit CSISD campuses to award grants to this year’s winners. Each winning teacher will be surprised with a check and cheering presenters to mark the occasion. The Education Foundation has awarded 306 teacher grants totaling $742,005 since its inception in 1999. Many businesses and community members make these grants possible through fundraising events and donations. 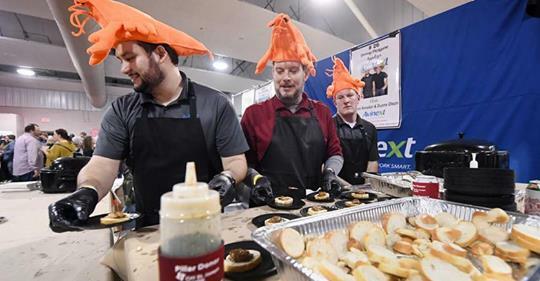 Commerce National Bank has been the “Top Chef” sponsor of the annual 50 Men Who Can Cook event for the past eight years and has committed again this year. The CSISD staff also has supported the Education Foundation tremendously by giving though payroll deduction donating over $49,000 last year which is all earmarked for teaching grants. The Education Foundation accepts grant applications annually in the fall from district teachers and staff for the development and implementation of innovative teaching programs within the classroom, which are not otherwise funded by tax dollars. Grants are selected by a committee comprised of board members and curriculum/instruction staff. For more a complete list of the grants awarded visit givetokids.csisd.org. For more information, please contact Teresa Benden (979)-764-5400 or tbenden@csisd.org. College Station ISD Education Foundation is pleased to announce that Dr. Leonard and Mayor Nancy Berry have endowed a $20,000 scholarship for CSISD graduating seniors. The Berrys presented a check to Education Foundation President James Haverland and Director Teresa Benden at the September board meeting. The Berry Family Endowed Scholarship will first be awarded next May and be offered to CSISD graduating seniors who have financial need with a minimum overall GPA of 3.0 and may be used for technical school, junior college or a 4-year university. College Station ISD Education Foundation is pleased to recognize and thank Branch Banking & Trust (BB&T) for their "Teacher of the Month" recognition program implemented over the past two years at College Station ISD schools. "We appreciate BB&T and their sponsorship of the the Teacher of the Month Program," said Superintendent Dr. Clark Ealy. 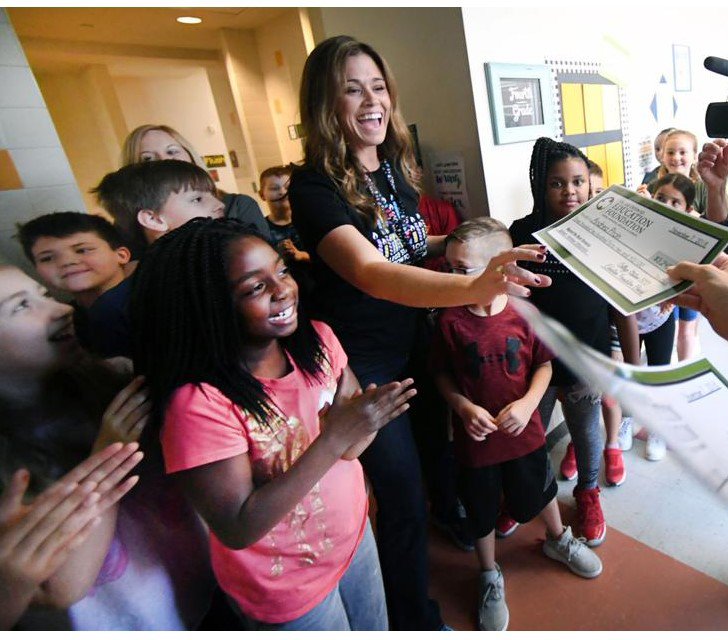 "Their monthly award presentations are a great reminder of the key role that teachers play in the academic, social and emotional development of students and a great example of how much our community supports College Station ISD." Two campuses each month are asked to select their "Teacher of the Month" based on merit. A presentation is made at each school awarding the winner a $50 Visa card for his/her personal use. "There are many great ways that businesses can get involved in our school district to make the educational experience better for students and teachers," said Education Foundation Board President James Haverland. "We are very appreciative of BB&T stepping up and sponsoring this great program." The program will continue for a third year in College Station schools beginning in September.